Sound wave vibrations are collected by the outer ear and directed through the ear canal to the eardrum. The eardrum movements travel through the hearing bones and are transferred to the fluid in the inner ear. 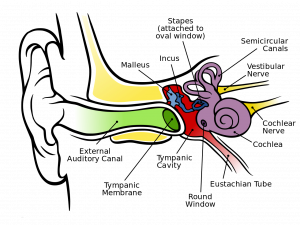 The hearing cells in the cochlea (hearing organ) move with the vibrations. This movement transfers into electrical impulses that are transmitted along the Auditory nerve to the brain.